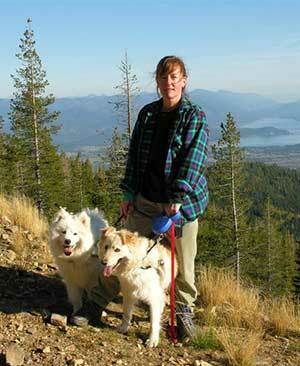 Hiking with the furry white dogs. When you adopt a dog from an animal shelter or rescue group, you save a life. Obviously adoption is good for the dog, but it’s also good for you. Countless studies have shown that contact with pets makes you feel good, both physically and mentally. Owning a dog can contribute to your health and well-being. In fact, petting any animal lowers your pulse rate and your blood pressure. Plus, if you own a dog, you always have someone who is thrilled when you come home and accepts you for exactly who you are. Having a dog in your house can make you feel safer and less isolated. When you have a dog, you tend to get out more. Personally, I’ve discovered that when I take my own dog Fiona for a walk in town, people look at me and smile. (Fi is very cute!) Many movies and books have joked about the fact that if you want to get a date, borrow a dog. Go hiking. We have hiked many miles with our two young dogs. They love getting out as much as we do. All we need to do is pack leashes and extra water for the canines, and they’re good to go. Attend classes. Along with obedience classes, you can participate in dog sports like flyball and agility. Or take “clicker classes” and teach your dogs fun tricks. Share your dog with others. Many retirement facilities and hospitals let you bring in pets for visits. My dog Fiona and I visit a local nursing home regularly. In fact, Fi is starting to have her own “fan base” among the residents now. I’m looking into getting her registered with the Delta Society, which is one of the groups that helps owners train their dogs to become furry ambassadors of happiness. Never underestimate the power of pets to keep you healthy and happy. The human-animal bond is a special thing. And if you’re thinking of getting a dog, please consider the adoption option and save a life.